We'll use the other half of the puff pastry next week. It will keep for 2 weeks in the fridge, longer in the freezer. Bake the fish while you eat the pizzas. Little pizzas, made with prepared puff pastry, make an easy first course. Make them smaller and you have finger food for a cocktail party. These are topped with browned shallots, a bit of bacon and cheese on a tomato base.... Mini pizza! Heat oil in medium skillet, add shallots, bacon and sauté over medium-high heat until browned and starting to crisp. Mix ketchup, soy sauce and oregano in a small bowl. Lay out puff pastry and cut two 5 inch circles (12 cm). Use a bowl as a guide. Divide the ketchup mixture and spread within the scored lines. Spread the shallots and bacon evenly on the pastries. 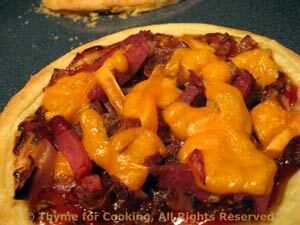 Top with the cheese, keeping all of the ingredients within the scored lines. Bake in a pre-heated oven at 420F (210C) for 8 - 12 minutes, until sides of pastry have puffed around middle and are golden brown. Sole is often sautéed, but baking in a light sauce results in a moist, flaky fish that needs little attention. This recipe is easy enough for the novice cook but impressive enough for a dinner party. It can easily be doubled or tripled to serve more, just use larger or more baking dishes. Rinse fillets and pat dry. Lay fillets out in a single layer in a baking dish. Sprinkle with lemon juice, 1 tbs olive oil and paprika. 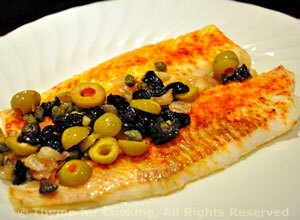 Bake at 350F (175C) for 12 - 18 minutes, depending on thickness of filets, or until fish flakes easily. Heat 1 tbs oil in medium nonstick skillet. Add shallot and garlic and sauté until tender. To serve: Remove fish carefully, spoon sauce over top and serve. Barley is a hearty, nutritious grain; easy to cook and flavorful. 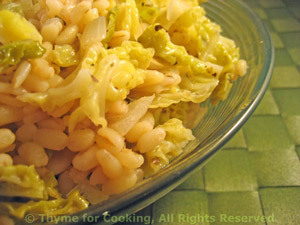 Here it's cooked in the same skillet with the cabbage and onion for a 'one-dish side dish'. Heat oil in a large nonstick skillet. Add shallot and sauté until tender. Add cabbage and sauté a few minutes until it starts to wilt. Add barley, stock, wine, thyme, stir well and cover. Simmer 20 minutes, (or whatever your barley calls for) stirring occasionally.